The iPad edition for Dennis Publishing title The Week, which describes itself as "an original take on world news as it happens", was named Digital Edition of the Year at the PPA Data & Digital Publishing Awards this week. Speaking to Journalism.co.uk earlier in the week at the Mobile Media Strategies conference on Tuesday (25 September), head of apps at Dennis Publishing Alex Watson said that the iPad app, which launched in November last year, has recorded more than 300,000 downloads in the US and UK, with around 32,000 readers in the UK a week. According to a list of the winners published by PPA, judges praised Dennis Publishing for having "approached this title with real intelligence to produce an elegant, focussed digital edition that has delivered a strong return on investment". "By putting the business model ahead of the technology, they have gone on to create something that truly stands out from the competition." Watson told Journalism.co.uk he was pleased that the "very holistic approach" taken, and their efforts to "integrate it into the business" were recognised. Also at the PPA awards last night, Reed Business Information's Estates Gazette and Future Publishing were named digital publishers of the year for business media and consumer media respectively. The judges were said to have "congratulated Estates Gazette for leading through innovation". "The big decision - to dramatically transform all services to allow readers to consume the content across different platforms – resulted in great subscriber renewal rates and large increases in traffic." And Future Publishing was said to be "always ahead of the pack" and "continues to impress, through developing its own in-house video production capability and app creation software, to the use of video advertising and interactive tablet editions". This follows Future Publishing being awarded the Launch of the Year from the Association of Online Publishers in July, following its "bold investment" in magazine editions for Apple Newsstand. In a trading update published today the magazine publisher reported sales of more than £5 million for its digital editions sold via Apple Newsstand. Speaking to Journalism.co.uk today, Future's chief executive Mark Wood said he is "very proud" and that both awards have been "a great accolade". "I've been determined that we want to make this company a much more digital business as quickly as possible and we've moved fast, we've taken advantage of opportunities and there are a lot of talents in Future, it's a great team and we have great digital skills. "That's been particularly clear when you look at our success on the Apple Newsstand to date, where I think we're still the leading UK publisher in terms of sales, and I'm very very pleased that we're generating substantial traffic growth on our websites." He added that Future is "selling beyond the Apple Newsstand", but said it is currently the "main selling platform". "We've seen steady sales growth which we're very, very pleased with, and a lot of that is I think because we've been quite innovative, we've just launched another weekly today, which is a photography weekly, we're moving from monthlies to weeklies in some areas, producing one-off specials and we do see tablets as a fabulous way to present our content and also to reach new markets and new audiences." 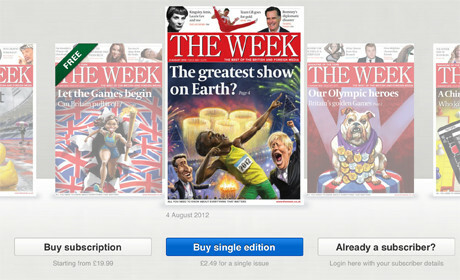 He added that it has found demand for more regular digital packages, which supports moves to weeklies for some editions. "What we're finding is by looking at useage is that in some areas people want a smaller, digital package but more regularly. We've done that with Cycling News HD, and we're now doing it with photography and we have other plans. "We'll do more of this because it suits the medium to have shorter, smaller packages, more regularly." Other winners at the PPA conference include companies data website Duedil which was named Newcomer of the Year.